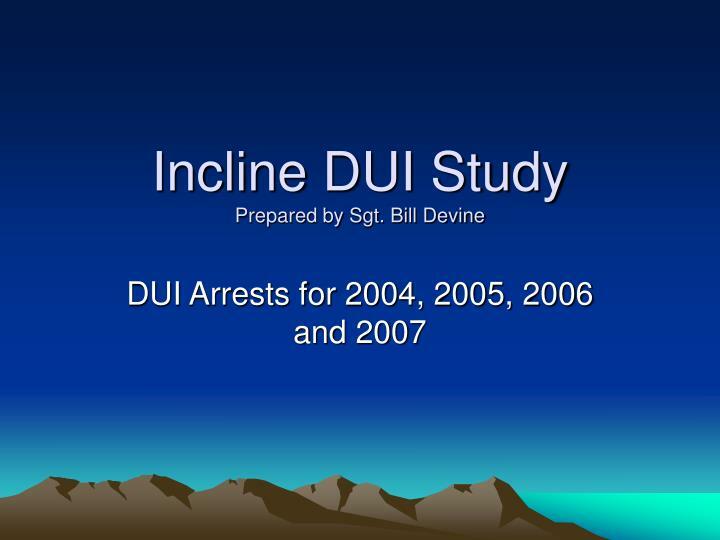 Incline DUI Study Prepared by Sgt. Bill Devine. 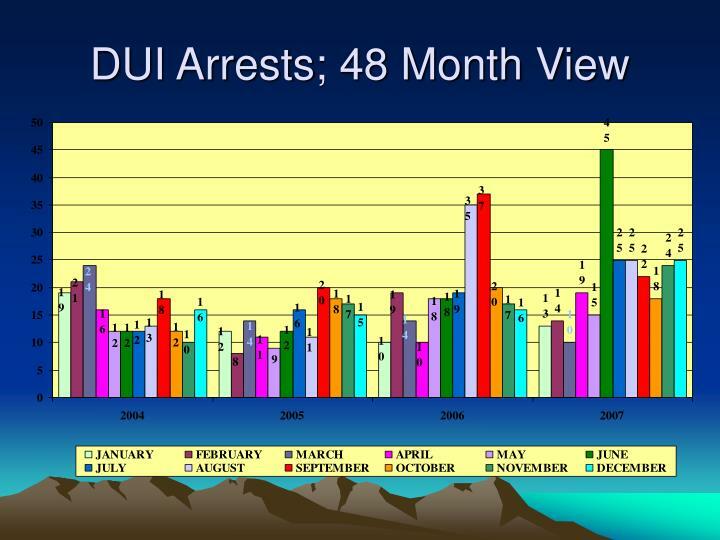 DUI Arrests for 2004, 2005, 2006 and 2007. 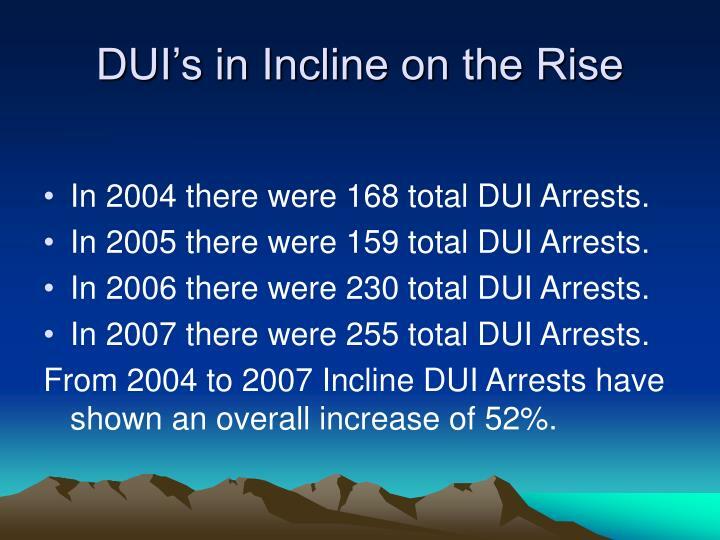 DUI’s in Incline on the Rise. In 2004 there were 168 total DUI Arrests. In 2005 there were 159 total DUI Arrests. 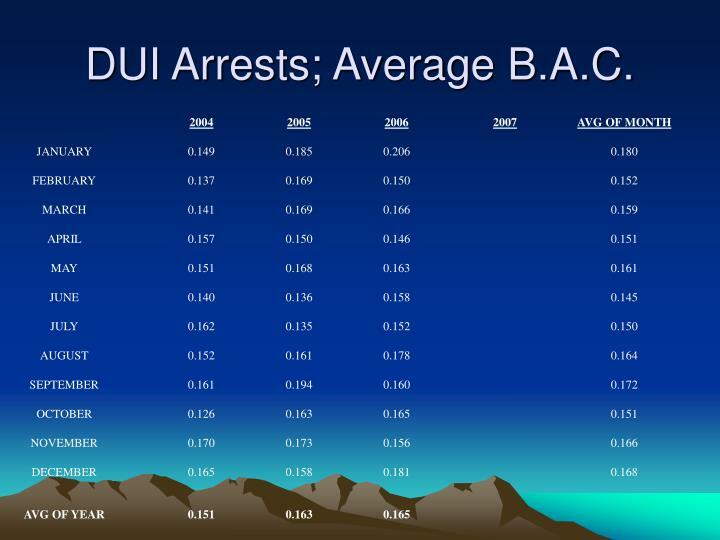 In 2006 there were 230 total DUI Arrests. 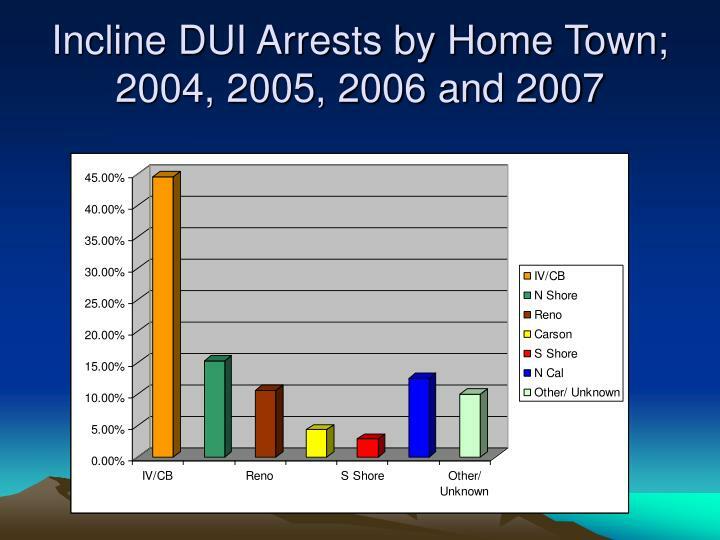 In 2007 there were 255 total DUI Arrests. In 2004 there were 168 total DUI Arrests. In 2005 there were 159 total DUI Arrests. In 2006 there were 230 total DUI Arrests. 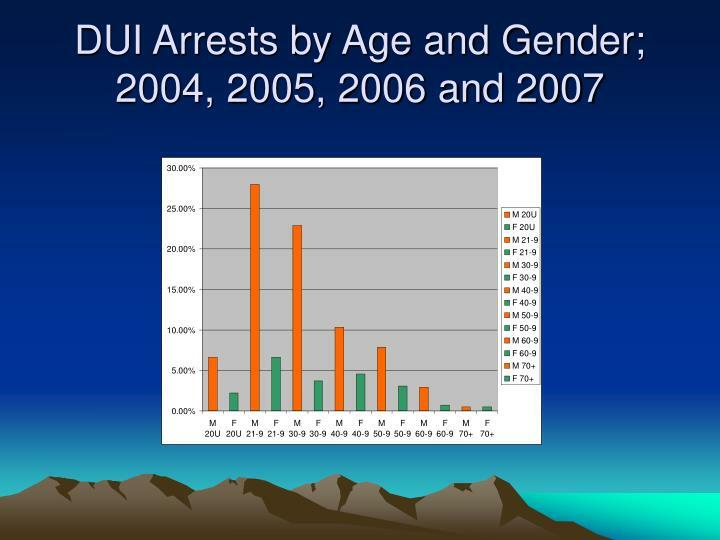 In 2007 there were 255 total DUI Arrests. 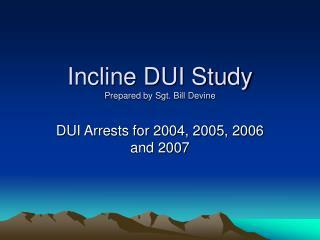 From 2004 to 2007 Incline DUI Arrests have shown an overall increase of 52%. 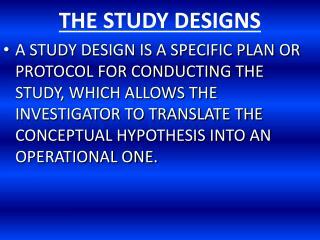 In 2004, 913 citations were issued. In 2005, 1159 citations were issued. 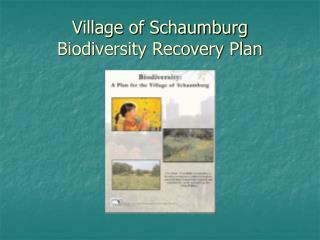 In 2006, 1369 citations were issued. 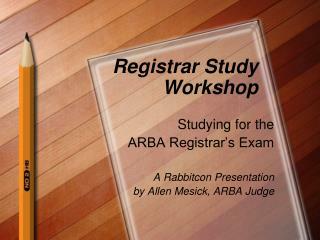 In 2007, 1716 citations were issued. 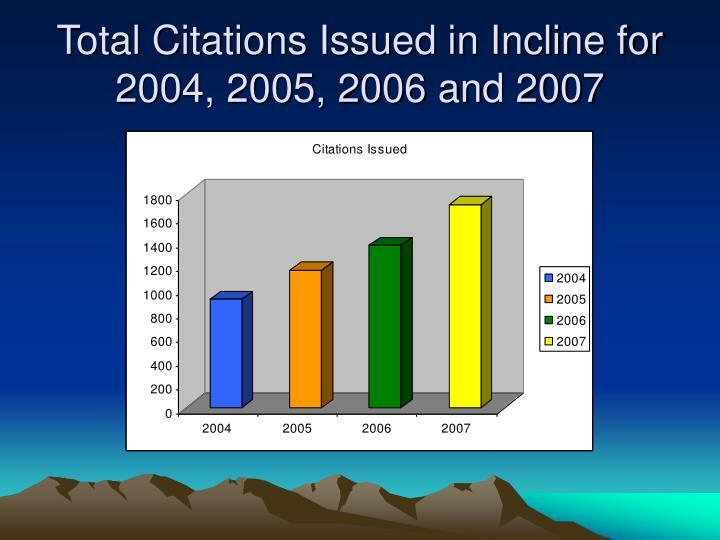 From 2004 to 2007 Incline citations have shown an overall increase of 88%. In 2004, 111 accidents were reported in Incline. 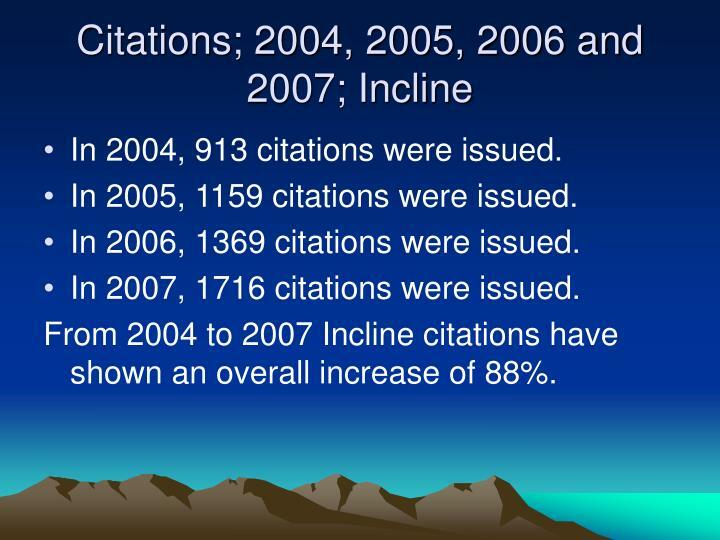 In 2005, 86 accidents were reported in Incline. 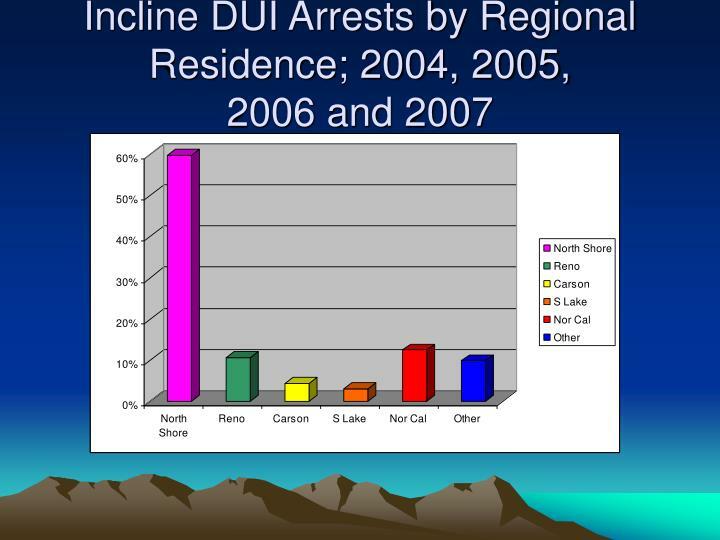 In 2006, 108 accidents were reported in Incline. 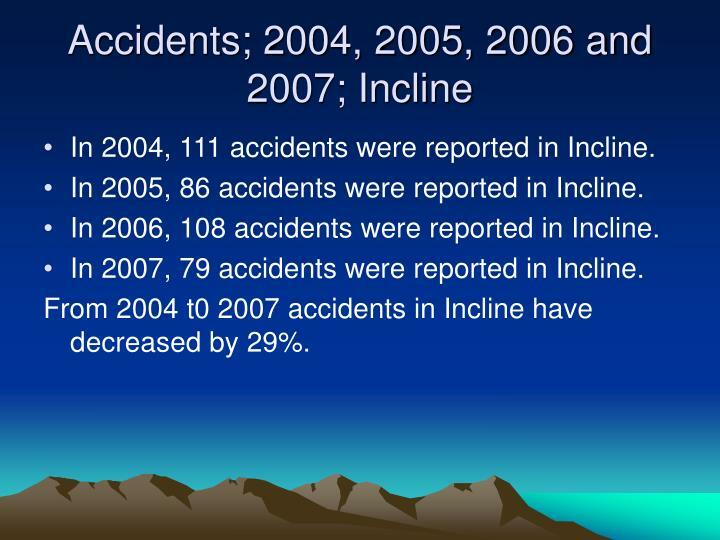 In 2007, 79 accidents were reported in Incline. 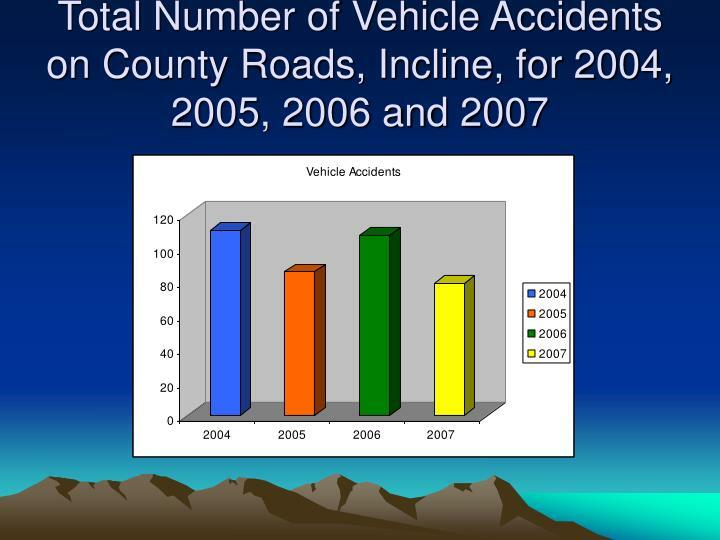 From 2004 t0 2007 accidents in Incline have decreased by 29%. 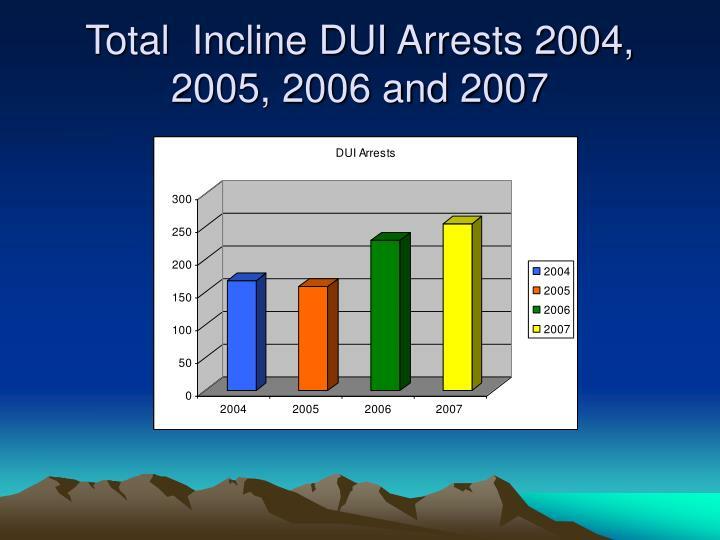 From 2004 thru 2007 Traffic Citations and DUI Arrests Increased in Incline. 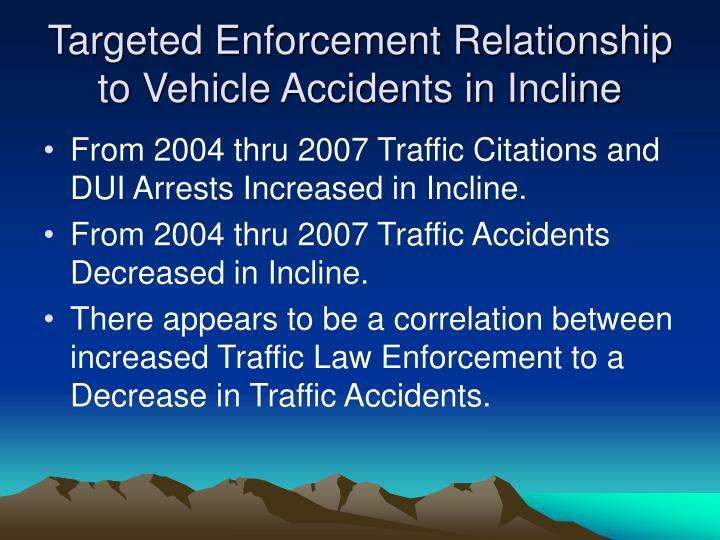 From 2004 thru 2007 Traffic Accidents Decreased in Incline. 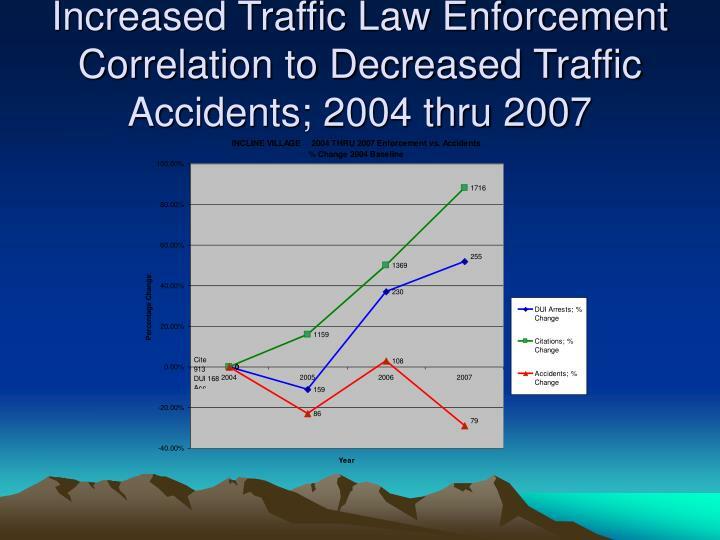 There appears to be a correlation between increased Traffic Law Enforcement to a Decrease in Traffic Accidents. 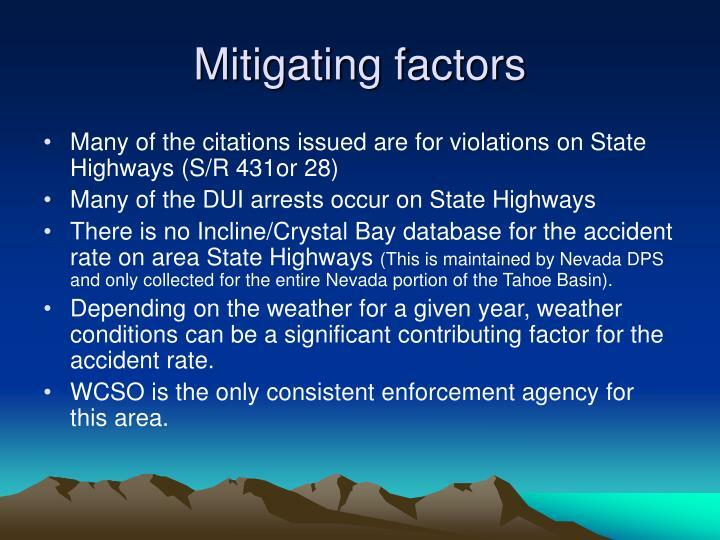 There is no Incline/Crystal Bay database for the accident rate on area State Highways (This is maintained by Nevada DPS and only collected for the entire Nevada portion of the Tahoe Basin). Depending on the weather for a given year, weather conditions can be a significant contributing factor for the accident rate. WCSO is the only consistent enforcement agency for this area. 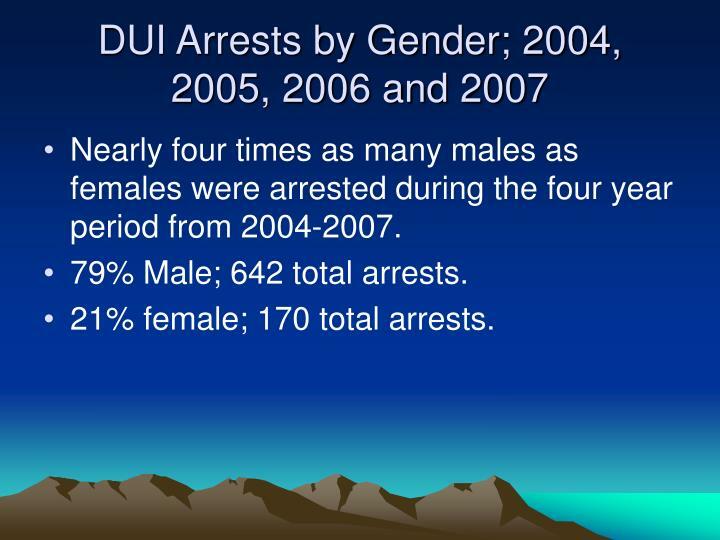 Nearly four times as many males as females were arrested during the four year period from 2004-2007. 79% Male; 642 total arrests. 21% female; 170 total arrests. 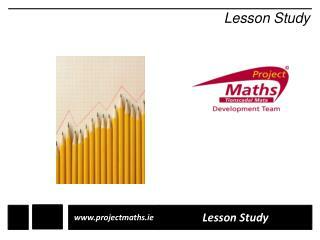 Four year study period revealed that a significant number of arrestees (approximately half) are males between the ages of 21 and 39. 36% male 21-29; 229 arrests. 28% male 30-39; 184 arrests. 64% male 21-39; 413 out of 642 total arrests. 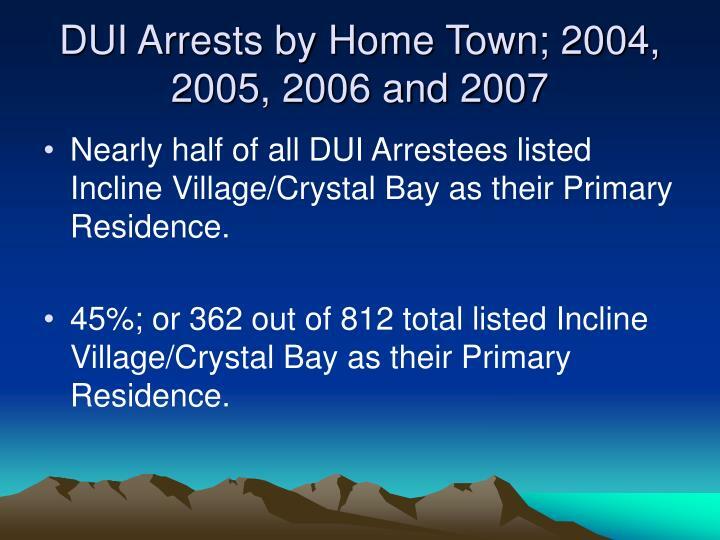 Nearly half of all DUI Arrestees listed Incline Village/Crystal Bay as their Primary Residence. 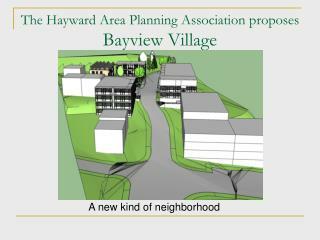 45%; or 362 out of 812 total listed Incline Village/Crystal Bay as their Primary Residence. In an effort to differentiate between ‘Locals’ and Tourists; we combined North Shore Residents (‘Locals’) into one category. The other five categories were grouped as well into the following: Northern California; Reno/Sparks; Carson Valley; South Lake and Other/Unknown (Possibly tourists). 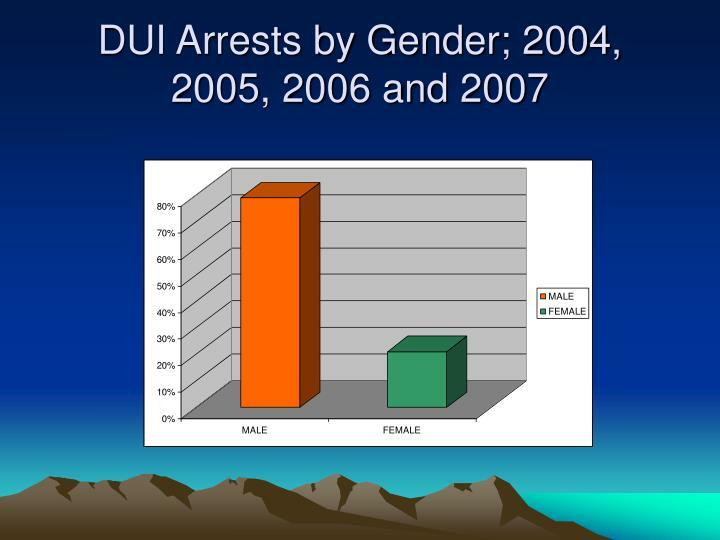 Males are arrested for DUI at roughly four times the rate as females. 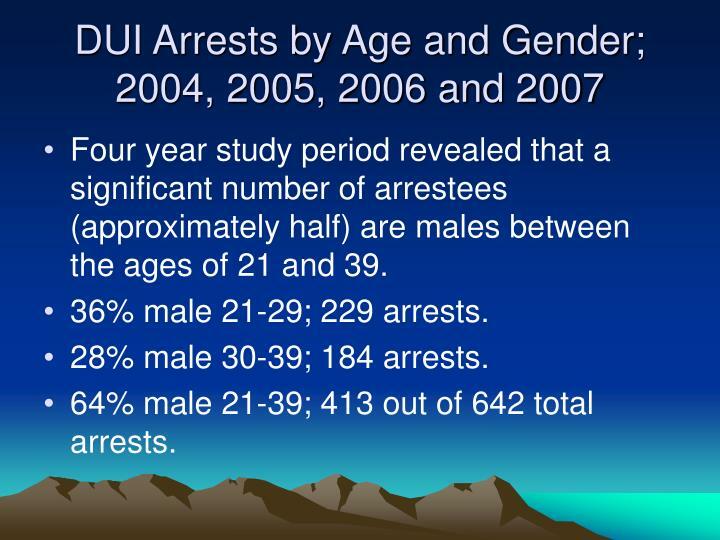 Males in the 21-39 Age Group comprise approximately 64% of all DUI Arrests. 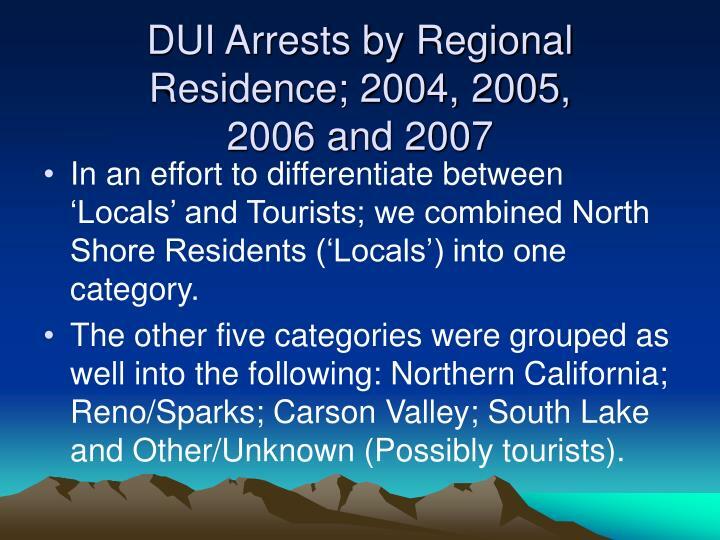 77% of Arrestees appear to be non-tourist; in other words they reside in the Lake Tahoe Basin, Reno or the Carson Valley. The average B.A.C. is approximately double the Legal Limit (2004-2006 pending 2007). Patrol Saturation for particular time frames. 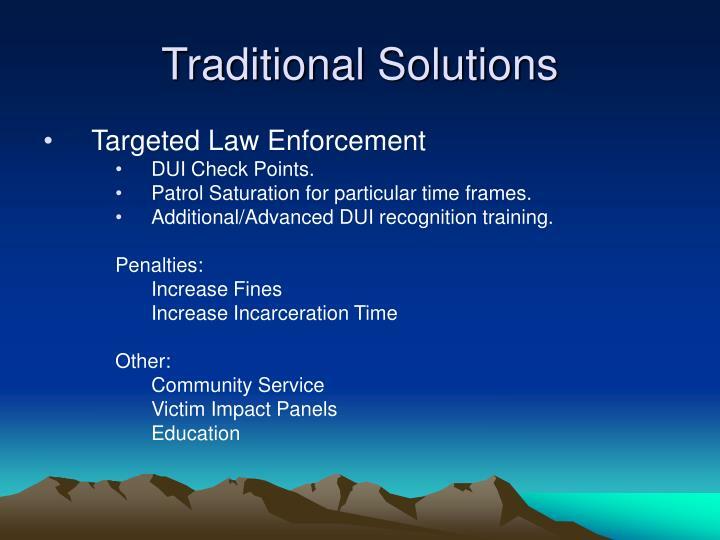 Create 3 sobriety checkpoints entering Incline/Crystal Bay every Friday and Saturday from 1700-0300 for one month. Put arrestee name and picture in the local paper; and list first, second, etc… DUI charge. Create a ‘Tipsy Taxi’ fund (Annual Fund Raiser). Card available at bars and casinos. Train bartenders to spot ‘Tipsy’ person. Stress promptness to cab companies. “Designated Driver” non profit corporation formed. 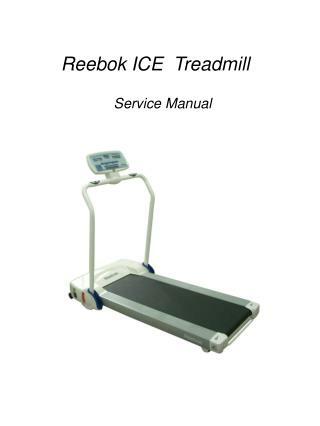 Program being used in California created by a Nick Yaya. Two ‘riders’ provided to each subscribing bar/casino. One drives the ‘tipsy’ person home while the other follows in the patron’s car. 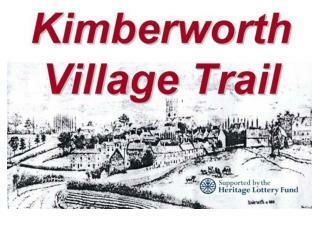 Funded by bars/casinos and operates during a pre-designated time. 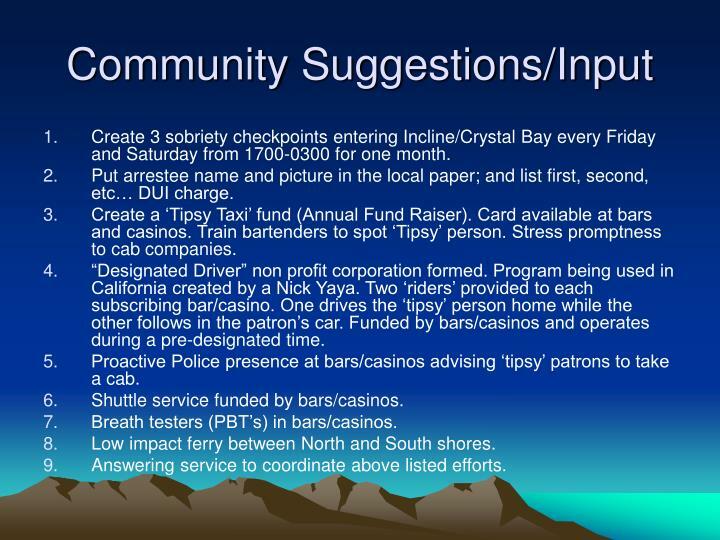 Proactive Police presence at bars/casinos advising ‘tipsy’ patrons to take a cab. Shuttle service funded by bars/casinos. Breath testers (PBT’s) in bars/casinos. Low impact ferry between North and South shores. 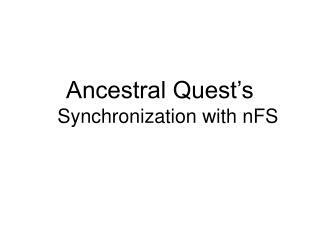 Answering service to coordinate above listed efforts. 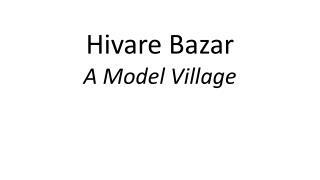 Hivare Bazar A Model Village -. 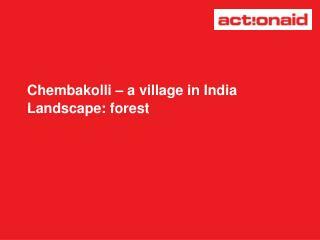 hivare bazar is living bapu’s dreams today…. our hivare bazar - my village. 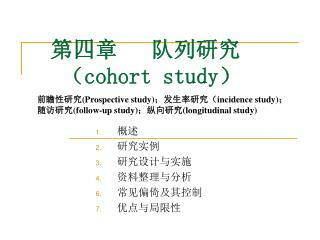 during 1972- 1989 = 17 years. migration to dharavi (mumbai). 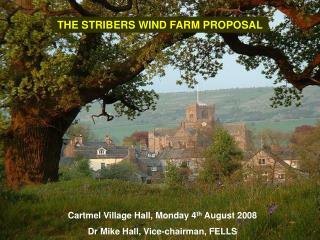 the transition - 1989. elected as sarpanch (village chief)..
Cartmel Village Hall, Monday 4 th August 2008 Dr Mike Hall, Vice-chairman, FELLS -The stribers wind farm proposal. cartmel village hall, monday 4 th august 2008 dr mike hall, vice-chairman, fells. outline why is cumbria under siege? 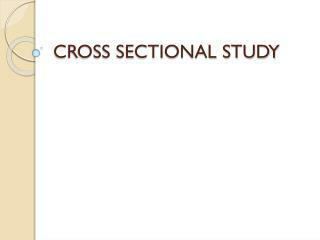 Rests & Rest Seats -Rests &amp; rest seats. rest. a rigid component resting in a recessed preparation on the occlusal, lingual or incisal surface provides vertical support. rest seat. 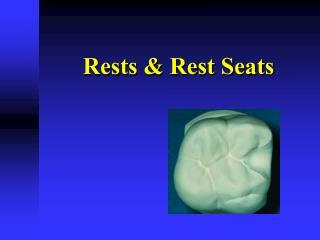 portion of a tooth prepared to receive a rest.